Recent Art Director work with All Ages Productions and Bravo Tv. Head over to the “Production Work” section of my site to view more pics of my designs and behind the scenes. Recent work for Craftsman with Expressway Productions and RedTettemer. This job created the challenge of taking three blank canvas locations and turning them into a car hobbyists garage, a motorcycle garage, and a woodworkers garage. it was a fun change of pace to work on set dressing that asked to be made dirtier vs being cleaned up. Very happy with how this came out. IKEA "Solve it in a Snap"
Check out this recent McCormick Spices job I did props on with Mozell Films in Baltimore. Check out my recent film "Fergadelphia Channel 34" which I premiered at this years Sloppy Film Fest in Philadelphia. This year I took home the first place audience prize. This was a piece that I created for the festival which incorporated several smaller video pieces which I bundled together under the format of a tv channel with hosts and bumpers. Check out the new Swoonfull.com website and the prop styling that I did for the entire site. Some of the shots were taken on location at The Ritz Carlton in downtown Philadelphia and others were created in the studio with Brett Thomas Photography. Swoonfull.com has been a client since their launch in 2015. Heres a few sample images below. Check out this wierd short I directed, shot, and edited. Just found these cool book trailers I did props on for Quirk Books with Get Kinetic this past spring. This is one of two spots I recently Art Directed for Pedigree working with The Public Record, BBDO NY, and Dan from The Wounded Warrior Project. It was really nice to be a part of such a positive shoot. Recently dropped this music video for the NJ grindcore band Organ Dealer. I concepted and directed the shoot, built and styled the sets, and did some editing. My dear friend and colaborator Thomas Ignatious took up duties as Director of Photography and also edited. We are hoping to work on more projects together. Recently dug up a few photos from a job I did in December with Teva Pharmaceuticals and BicMedia. 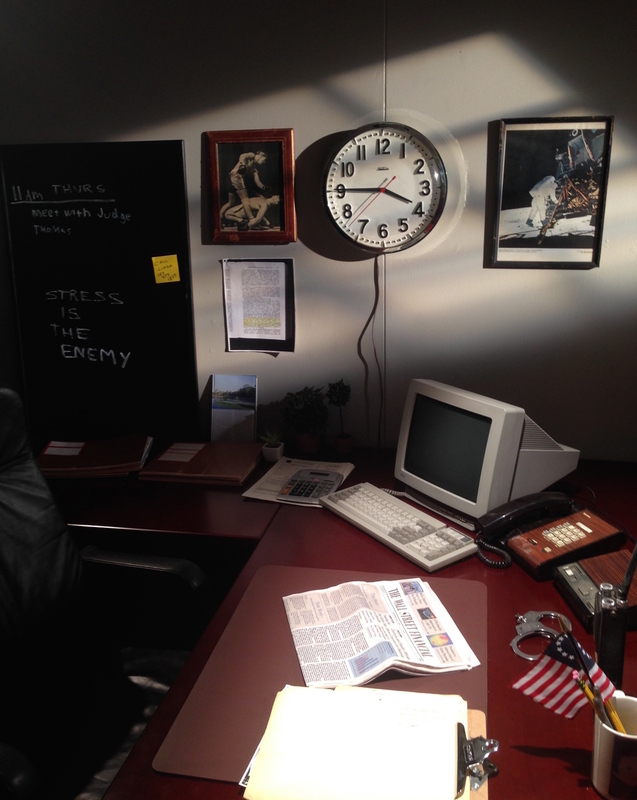 I was tasked with turning a blank office space into a police station in the style an 80's "cop drama" television show. I recently was asked by photographer Matt Bender whom I've worked with on a few commercial shoots if I would be a part of his photo series of documenting artists working in their studio. Click the link below to the collection of photos. Big thanks to Matt for including me in this series! "The Legend of the Chincoteague Cat Pony"
Got to work with the art department on a Tv show called "Class Act" airing on EdTv in Wilmington Delaware. It is a class room renovation show where students submit videos on behalf of influential teachers whom they think deserve a new classroom. We had a total blast busting our butts to make an awesome new chorus room. Some of my favorite moments were decoupaging old sheet music on to filing cabinets to be used as a new desk and repurposing old instruments to make lamps for the teachers office. Chris Jones did a great job with his design.